OUR TAX DOLLARS [American Spectator]: The federal government, through the CIA intends to investigate the effects of human engineering on Earth’s environment …the study will be run by the National Academy of Sciences (NAS) and will take 21 months to complete. Edward Price: It’s natural that on a subject like climate change the Agency would work with scientists to better understand the phenomenon and its implications on national security. This study by the federal “intelligence” committee was first proposed in 2008 – all during the Obama administration. Meanwhile: Mexican invaders continue to pour over our borders and those who came to US uninvited [filling our jails and prisons from violent crimes] continues unabated, subversive Reconquista and Islamic subversive organizations [Muslim Brotherhood and Islamic training camps] continue to operate as well as increase of insertion of Mexican drug cartel operatives continue. What was that about national security? Climate change is a national security priority over “phenomenon” just described? So-called climate change is a theory, subversion activity is fact – at last count there are 35 Jihad-Islamic training camps in United States. The worst enemy in US is ourselves headed by the federal government ignoring true threats. Madness continues with those “serving” in the federal government in the forefront. And in the wake of the verdict, I know those passions may be running even higher. But we are a nation of laws, and a jury has spoken. I now ask every American to respect the call for calm reflection from two parents who lost their young son. George Zimmerman has been acquitted: Not Guilty of Second-Degree Murder and Not Guilty of Manslaughter charges. The six women jurors deliberated for 15 hours over two days before the verdict was reached about 10pm, Saturday. The prosecution’s case was weak and fortunately the jury provided a benefit of doubt, and considered that the forensic evidence showed that Trayvon Martin was the aggressor, beating on Zimmerman, who did not pull his firearm from the holster until Martin had his hands near where he carried his concealed carry firearm. Yet people are sad that he was not convicted. Racism has been prevalent throughout this trial – Zimmerman, in the eyes of media [thanks to them the fervor] and with the aid of stupid remarks from President Obama [a president should never interfere with such a civil case], immediately Zimmerman was deemed a racist. Congressional members were just as guilty of prejudicial remarks. No one considered that Zimmerman had not only been a member of a community watch, but also reportedly helped young people of the community who were black. It did not matter to the general black public. It did not matter that the media at first painted Zimmerman as white, and later found he was Hispanic – mostly because of his non-Hispanic surname, Zimmerman. The media and the president is to blame for any repercussions of the verdict delivered by the jury. After 15 months he is a free man, but is he? Throughout the ordeal, George Zimmerman was guilty until proven innocent. A little different from what the law reads. Whose screams were heard on the 911 calls? At the beginning, the Martin family were unsure of whose voice was on the recording of cries for help, but later, after a meeting with the family as a collective, they changed that to stating that it was definitely Trayvon Martin. Friends of Zimmerman state that it was the voice of George Zimmerman. No voice print expert was ever produced during the trial to investigate by voice pattern who was crying for help, and the judge would not allow anything found on Martin’s cell phone that could be used for evidence of Martin’s possible intentions or his background of being violent or criminal activities. Who was on top when the shooting occurred? Neighbors saw the struggle in the darkness, but the question was who was the aggressor, the one on top of the other beating the person on the ground. Jonathan Good, who had the best view, stated he saw a person in dark clothing straddling someone in red or white clothing and was using his fists in a downward, pummeling motion on the person on the ground. Zimmerman’s injuries indicate that he was the one pummeled with fists. The Trayvon Martin shooting case is sticky enough, with the prosecution reaching for straws in order to convict George Zimmerman for Second-Degree Murder, but the morons [and racists] in cyberspace are not helping matters much. Neither has the mainstream media in the whole reporting history of the case. Now it has gone “viral” over the chain Email circuit that the 17-year-old had tattoos and looked more like a gangster than the innocent-looking youth the media presented [next to a not so good photo of Zimmerman]. The prosecution in the George Zimmerman trial is reaching for straws as it hopes through school records and applications that he was a wannabe cop who became increasingly frustrated by incidents of crime in his gated community. 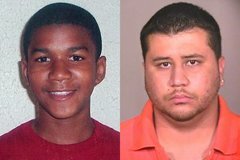 The prosecution maintains that when Zimmerman saw Martin he profiled the teenager and followed him, which led to a confrontation and ended up with Martin being shot to death. The prosecution, after obtaining permission to obtain and submit school records of Zimmerman, also stated that part of the course curriculum included how to be a good witness.